Looking for a mobile data collection solution for pipeline regulatory compliance? One that your contractors and employees will actually use? Try GeoJot+. Installers and inspectors can simply take a picture and fill out a form using their own smartphone or tablet. GPS photos and data are automatically transferred back to your office via the cloud where you can create management reports, photo maps, and input for Esri ArcGIS or backend databases. Contact us to discuss how this can work for your entire team. 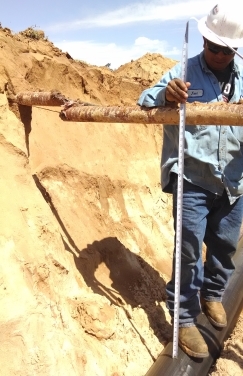 In addition to collecting pipeline construction data, GeoJot+ is used for: inspecting well pads and equipment, right of way vegetation management, exploration, disaster response, MOC, as built data capture, inspection of above ground pipes, tank tracking, pipeline patrol surveys, and much more. To learn more check out our recorded pipeline webinar or read a use case from the Mississippian Oil Play recently published in MidStream Business Magazine. Check out our other published use cases to see how our photo mapping products have been used for years for energy exploration and oil spill response.